From 30 Mar. - 2 Apr. 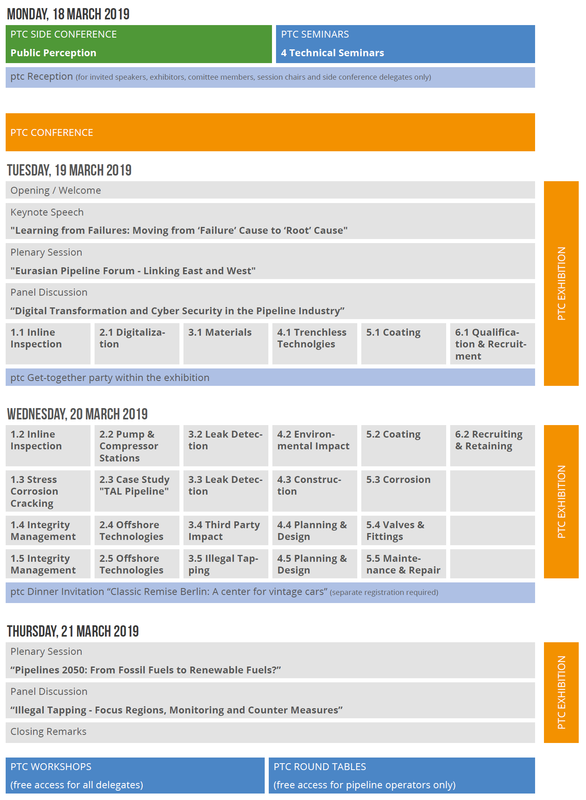 2020 Europe’s leading conference and exhibition on pipeline systems, the Pipeline Technology Conference, will take place for the 15th time. On 30 March, a series of ptc side conferences and ptc seminars will take place, followed by the opening of the ptc conference and exhibition on 31 March. ptc 2020 offers again opportunities for operators as well as technology and service providers to exchange latest onshore and offshore technologies and new developments supporting the energy strategies world-wide. More than 800 delegates and 80 exhibitors are expected to participate in the 15th ptc in Berlin. The practical nature of ptc was always based on the cooperation with our technical and scientific supporters and on a top-class international advisory committee. The conference will feature lectures and presentations on all aspects surrounding oil, gas, water and product high, medium and low pressure pipeline systems. Please take a closer look into the "Conference Program" and get involved now - become a delegate or reserve your stand at the exhibition. This is a small selection of presentations from ptc 2018. Visit our Video Section for more videos. I would like to thank for the organization of such an extraordinary professional event. 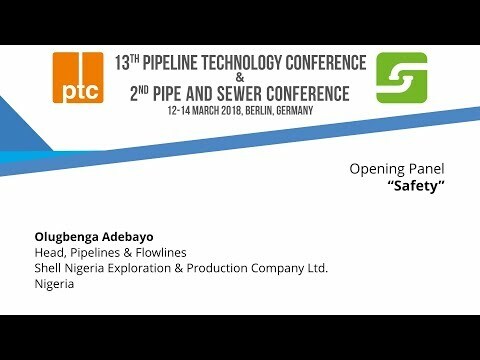 My time at Pipeline Technology Conference in Berlin was purposeful and pleasantly spend. Thank you very much for defining illegal tapping as focus of the Pipeline Technology Conference in Berlin. The discussion on the topic has shown that despite a wide variety of preconditions, the problem exists all over the world. The exchange with the other pipeline operators from Europe, Asia and Africa was very fruitful. I encourage our collegues for creating a cooperation network, in order to innovate our startegies to tackle the problem. From CENIT Colombia we are willing and ready to support. A great event, packed with so much knowledge and great speakers, offering a unique experience. In terms of a continuously high standard of presentations and knowledgable attendees from both pipeline operators and vendors, PTC is not only the best chance to talk to many different vendors face-to-face, but establish a network, as well. It’s a good place to initiate collaboration and try to brainstorm ideas for new concepts on pipelines. The 2018 Pipeline Technology Conference far exceeded my expectations and is a great forum for technical knowledge and social contacts. Pipeline operators and technology providers under one roof is the best that one can expect. I look forward to attend the 2019 conference again. It was a great pleasure for me to attend the Pipeline Technology Conference again this year. I am happy to meet a large number of other pipeline operators, experts and professionals from all over the world here in Berlin with whom we can exchange information and share knowledge about pipeline's current safety, integrity and reliability aspects. It was nice to be part of this year's PTC. I have been looking all these years for something more specific dedicated to the onshore and offshore pipeline industry. Thanks to google as I kept researching and Bingo! PTC is it. I enjoyed every bit of the sessions and the organization was simply superb. Once again I would like to thank for your excellent management on organizing the 13th Pipeline Technology Conference which was above my expectation in terms of technical and social program. I have made a lot of interesting new contacts with experts from pipeline operators and technology providers from all over the world. I hope I can attend the next ptc from 19-21 March 2019 and meet you again there. This is my first time in the pipeline technology conference. It’s a very useful experience where I had opportunity to meet expert people and exchange experiences. I have seen other business and technology partners. It was really a good gain for me and I think I will attend it every year. The ptc conference has become the biggest and most important pipeline conference in Europe. At last we have a big pipeline event in Europe that could compete with IPC in Calgary and IBP in Rio.